Creating a beautiful, healthy smile that lasts a lifetime is our ultimate goal when treating patients. Your personal home care plays an important role in achieving that goal. Brush your teeth 2X daily for at least 2 minutes, with a soft bristle brush or electric toothbrush. Place the brush at a 45 degree angle to the gums and gently brush using a small circular motion, ensuring that you always feel the bristles on the gums. Light soft strokes! Using a forward motion brush your tongue to remove bacteria and freshen your breath. Dr. Hendry highly recommends electric toothbrushes. They are easy to use and can remove plaque efficiently. Simply place the bristles of the electric toothbrush on your gums and teeth and allow the brush to do it’s job. We recommend Sonic Care electric toothbrushes. Daily flossing is the best way to clean between the teeth and under the gumline. Flossing not only helps keep these spaces clean, it disrupts plaque colonies from building up, preventing damage to the gums, teeth, and bone. Floss holders are recommended if you have difficutly using convential floss. Curve the floss into a "C" shape around each tooth and under the gumline. 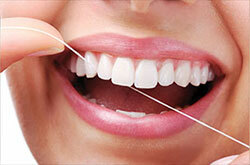 Gently move the floss up and down, cleaning each side of the tooth. When using any over the counter product it is a good idea to consult with your Dentist or Dental Hygienist on its effectiveness. Interdental brushes, rubber tip stimulators, tongue cleaners, irrigation devises, fluoride, and medicated rinses can all play a role in good dental home care when used appropriately.